Announcement All bags are lovingly and expertly crafted from premium interior design specialty fabrics coupled with only the best quilting cottons. Each bag is hand made by me, one at a time, in the USA. Please read the About section to learn more about Obiandoli, and thanks for shopping handmade. All bags are lovingly and expertly crafted from premium interior design specialty fabrics coupled with only the best quilting cottons. Each bag is hand made by me, one at a time, in the USA. Please read the About section to learn more about Obiandoli, and thanks for shopping handmade. Very beautiful tapestry handbag, great craftsmanship, awesome colors which are more for the Winter/Christmas time suitable, happy about it's one of a kind and only I have it. So it can become an heirloom, which makes it more special. The seller truly put all her love in every stich and it's unique design. This handbag, I might add, is just big enough to carry small necessities just what a girl needs to take along. Beautiful little purse. Very well made and unique. I love it! New faux leathers and fabrics waiting to become beautiful bags. Just listed the first one! New pleated handbag under construction - will be available in the shop late today or tomorrow. Just finishing up a new bag - pleated design like this one. Listing today! Many more coming - Obiandoli will be stocked with new bags, wristlets and zipper pouches for the holidays! I love mixing fabrics. So many textures and colors...so many possibilities. Functional, unique and gorgeous bags! I work mostly with premium home decor fabrics and have an extensive collection. To me, fabric is like an artist's palette. Obiandoli? What does that mean anyway? I get that a lot. Obiandoli is a combination of my parents' surnames. I thought it was a good choice for my shop name, since my parents were directly responsible for my love of fabrics and sewing. They started a remnant shop in 1950 that quickly became the largest fabric store in northern NJ - so I literally grew up with fine, quality fabrics. I absolutely love fabric. I moved from sewing clothing to creating fabulous handbags many years ago, and when Etsy came along...well, it was a no-brainer for me. My first Etsy handbag shop, LauraOhDesigns, opened in 2008. I'm honored that one of my original bags, under that label, was featured in Seaside Home, published by Stash Books in 2012. I closed LauraOhDesigns a few years ago to tend to family and relocation, and when I returned to making handbags, I just felt a new shop was in order. So...Obiandoli. I work only with premium quilting cottons and interior designer specialty fabrics, which lend themselves nicely to handbags and accessories. There is great satisfaction in working with beautiful fabrics..mixing and matching and sewing to create something special. 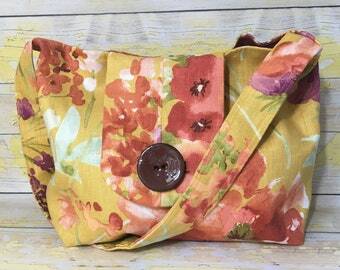 While I often use the same basic handbag design, the fabric combinations make each bag unique. I think that's one of the many benefits of buying handmade... you don't "see yourself coming and going" as my folks used to say. All Obiandoli bags are handmade by me alone, right here in the USA. Everything you see in my shop is ready to ship, and you will receive the item pictured. I am a non-smoker, I do this full time and I truly love what I am doing. Thanks for taking the time to learn more about me and my shop. I'm Laura, the shop owner, bag designer, fabric cutter, sewist, packaging agent, shipper, advertising agent, studio clean-up fairy, and coffee-maker. I've been sewing for more than half-a-century! Most of my bags are constructed with premium home decor fabrics, and spot cleaning is recommended. However, these fabrics are also stain resistant. Cleaning instructions are included in the item descriptions. I work with small amounts of fabulous fabrics, but I'm certainly willing to work with you if you have something in mind. Let's talk about it.